This was my lunch last week. I know that it may look less like lunch and more like penance, some apology for eating too many squares of salted-caramel-glazed fanned-apples-atop-1000-layers-of-buttery-pastry. I realize that most people think that when you start serving them bowls hearty grains and roasted squash that you might have an ulterior motive, like their thighs. I understand that most people don’t believe me when I say this, but it doesn’t make it any less true: I don’t eat food because it’s good for me; I eat it because I like it. And this was one of the most delicious lunch salads I’ve ever made. Herein lies my approach to grain salads: I like whatever vegetables I’m using in the salad to be the bulk of it, and the grains to be the accent, like a crouton. When you make grain salad this way, you get to appreciate the texture, and not just lament that it’s not plush as a mound of fine couscous, something you’d hardly notice eating. This, however, does not mean that they’re to be crouton-free; all salads need punch and crunch, and here, it comes from toasted, salted pepitas (though any nut will do), crumbled ricotta salata (though any salty, crumbly cheese will do) and minced red onion that I pickled at the last minute in sherry vinegar. The salad is not a miracle worker. It did not convince a picky toddler who likes roasted squash and farro separately to eat them together. It did not photograph particularly sharply in the scrap of remaining daylight I had left at 5 pm. And it didn’t make this nagging cough I have disappear, or save me from a diagnosis of bronchitis, something I’m going to go out on a limb and suggest is not really something anyone hopes to hear a week before their book comes out. But not a single one of these things will matter when you’re eating it because it’s like dividing a big bowl of fall weekend bliss — all pumpkin patch orange, golden hay and waning green flecks. You will want it to last and last. The Smitten Kitchen Cookbook: Comes out ONE WEEK FROM TODAY. I am so excited that I keep spelling “book” with an extra-dramatic string of Os, booooook, which seems fitting for its pre-Halloween release. You can preorder the book from these stores. The book tour listings are here. And if you can’t make it to an event, here’s another way to get a signed book. And next Tuesday, we’re all making candy. Like most salads, this recipe works well as a template, meaning that many of the ingredients can be replaced with likeminded ones with little trouble. You can use other winter squashes in the place of the butternut (or even sweet potatoes), the farro could be replaced with barley, freekeh or another grain of your choice. The red onion could be shallots. The pepitas could be another toasted nut, roughly chopped and the ricotta salata could be feta or soft bits of goat cheese. The sherry vinegar could be a white wine vinegar. The pearling process removes the inedible hull that surrounds the wheat, and farro is generally sold either pearled, semi-pearled or regular. The pearled will take the shortest time to cook. If you’re not sure what you have, just use the cooking directions on the package. Below, I have the cooking times/process for semi-pearled. Peel squash, then halve lengthwise and scoop out seeds. 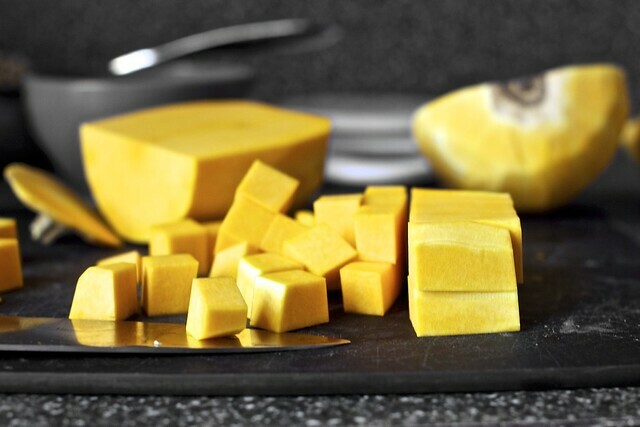 Cut squash into approximately 3/4-inch chunks. Coat one large or two small baking sheets with 2 tablespoons oil total. Spread squash out in single layer on sheet. Sprinkle with salt and freshly ground black pepper. Roast until pieces are tender, about 30 to 40 minutes, turning them over halfway through the cooking time. Set aside to cool slightly. While squash is roasting, cook farro in a large pot of simmering salted water until the grains are tender but chewy, about 30 minutes. (Since there are so many varieties of farro, however, if your package suggests otherwise, it’s best to defer to its cooking suggestion.) Drain and cool slightly. While squash is roasting and farro is simmering, in a small bowl, whisk together sherry vinegar, water, 1/2 teaspoon table salt and granulated sugar until sugar and salt dissolve. Stir in onion; it will barely be covered by vinegar mixture but don’t worry. 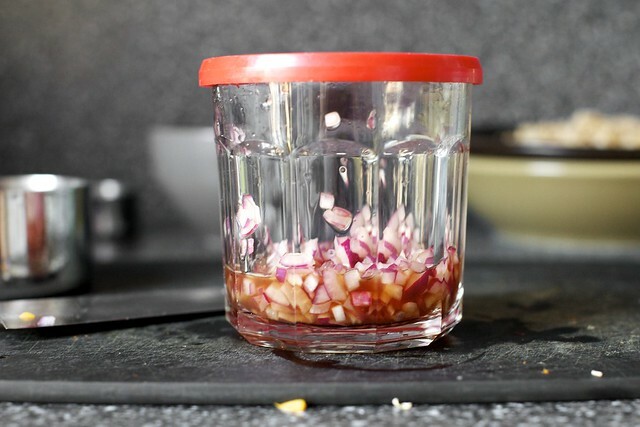 Cover and set in fridge until needed; 30 minutes is ideal but less time will still make a lovely, lightly pickled onion. 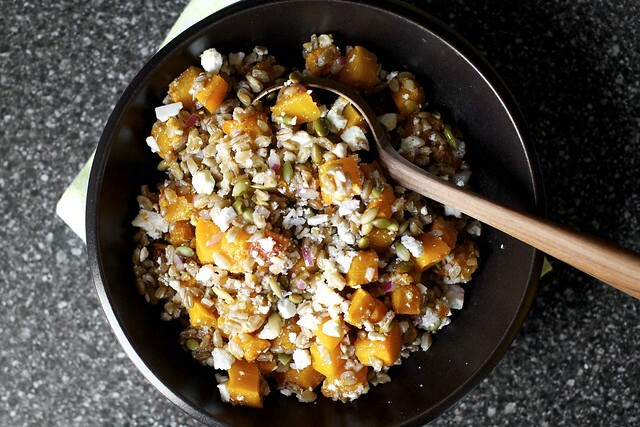 In a large bowl, mix together butternut squash, farro, red onion and its vinegar brine, the crumbled cheese and pepitas. Toss with 3 tablespoons of the remaining olive oil, use the 4th one only if needed. Taste and adjust seasonings. Eat now or later. Salad keeps in the fridge for up to a week. I am LOVING farro lately and will be making this tout de suite. Thank you!!! Can’t wait to get my pre-ordered copy of the boooooooook!! Why not toast the butternut squash seeds in a little butter and salt and use those instead of pepitas? Would you have to pry the seeds out of the hulls? I’ve made a meal with the seeds and left them in. I could handle chewing the hulls to squish the inside out and then spitting out the tough hull, but it got annoying. And I know my kids wouldn’t even try. With the pepitas they are already hulled. You mean this recipe is unhealthy or healthy? Seems pretty healthy to me! This looks delicious enough that I don’t care if it doesn’t make my thighs any smaller (even after all the Halloween candy I have been sneaking from the bag saved for trick-or-treaters). I can’t wait for your book! Combo that with 70 degree weather and it is a very happy October! I love roasted butternut squash, what a wonderful salad for fall! I love grain salads so, so much. And all the better that I am the only one who eats them–they last me all week. I have everything for this, save the farro. The good news is I have approximately 26 other grains that I can substitute. This Salad looks delicious! Just wanted to wish you well with your book release, Which is on our wedding anniversary so I already know it will be a great day! Looking forward to the UK edition coming out, will really have to try resist buying the US version when we holiday in NY in December! This sounds ideal for the pumpkin-carving get-together we’re planning over the weekend – but I have vegans attending! Will this lose a great deal of its appeal without the cheese(s)? Any suggestions for a replacement ingredient – or just leave it without the cheese and call it good? This seems like a wonderful way to use the hokkaido pumpkin I have in the kitchen! I’m looking forward to trying it! These are seriously all my favorite things brought together in one bowl– can’t wait to make this!! Is the recipe in the book as well? This looks delicious AND healthy, and I can’t wait to make it. I’ll definitely be adding farro, pepitas, and butternut squash to my shopping list this week. can’t wait to get my book. I pre-ordered it MONTHS ago. 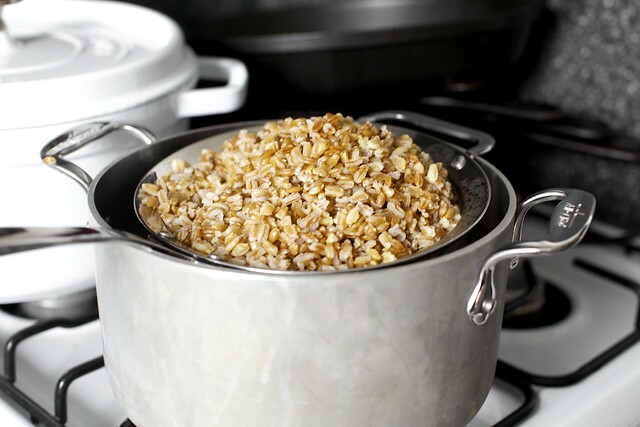 Farro is a grain I love to use but don’t do it often – great fall recipe! I’m all over pumpkin stuff these days! Who isn’t? I love grain salads. I have a hard time finding Farro locally — I’m thinking regular wheat will do? Sorry you are sick right before the big booook tour. I’ve never had farro, but this is the second recipe for it that I’ve seen in less than a week, so I’ll have to change that. Is it just me, or is there no link to a picture of your precious Jacob? Patty — Just added it. I was trying to upload a video but technology was not working in my favor. Maybe next time. I got him to talk about a big new slide at preschool. I just made all of my butternut squash into soup! A delicious roasted butternut squash and harissa soup, but still there is no squash for salad. An oversight I’ll have to remedy when I go to the grocery store next! Fall weekend bliss is right. And I can’t wait to finally pick up your book – seems like AGES ago you first announced the preorder! Congrats, Deb. Butternut is my favorite winter squash. I had something very similar to this over the weekend at a restaurant. Rather than using farro and the carb, the served it on toast and called it bruschetta. The ricotta was wonderful with it! Candy making? You know, that demands bringing homemade candy to your book launch, right? I’m counting down the sleeps and bookmarking this salad for when I come back from NYC with a bit of a food hangover. Just received the cookbook, really excited…love love love the look of it! Congratulations! Yummy. I love all of these ingredients, and this sounds amazing. Also, excited for the book!!!! Our garden had an overabundance of butternut squash this year and I am on a mission to try some new recipes! I am really looking forward to giving this recipe a try – it sounds delicious! This is my kind of meal. My husband, however, has the strangest malady. We’ve discovered that whenever I talk about an ancient grain – farro seems to be the worst offender – he can’t hear me. So if I say “Honey, we are having farro and parmasean pie for dinner,” he’ll look up and say, “I heard something about pie, but was there something else you said?” It’s become a a running joke. He does, however, love trains (director of public policy for a transportation association), so it’s pretty clear the path Jacob is on. Hope you feel better in the next week. Book tour and bronchitis sounds like a lousy plan. I have been looking for farro after been served a wonderful wild mushroom farro risotto type dish . I found a (too) expensive bag from Italy. Is that what everyone is buying? I’ve never tasted farro and also never heard of it. Now I must research it and find out more. From your pictures it looks great, but any dish looks yummy in the pictures you take. I wish you to get well soon so you can fully enjoy your book tour! My (3) copies of your book arrived in the mail yesterday (maybe Canada is a little ahead?) and I am in LOVE with it. So lovely. Thanks!!! A video would be awesome. Love every ingredient in this. Looks great for fall. Oh. Em. Gee. Did I just channel you?!? I’m sitting at my desk at work, eating lunch and went to visit one of my all-time favorite site (yours) and this recipe pops up! I’m currently eating my leftover farro, sweet potato and wilted beet green salad (with a little parmesan, of course, because cheese is a food group too). It must be a sign that I need to come to your book signing next Tues–that I have to find a way to cancel dinner plans that have already been rescheduled thrice… I CANNOT WAIT for my copy of your book to arrive though! @Dale. Basically, yes. I have 1/4 bag of that expensive farro from Eataly and it’s going in THIS. Note: My manhattan kitchen counter may actually be too small to cut up the squash on, so either I’ll do it in front of the TV in the living room or I but a plastic container of cut-up squash. looking yum either way. I have been wanting to delve into the world of farro and this seems like the perfect way to! No this does not look like penance… it looks delicious and perfect for fall! I will definitely be making it! I keep seeing you use the word ‘Pepita’ in several posts and I have no idea what it is and naturally I am curious. When I saw this recipe and was like, I really want to make this but I have no idea where to get pepitas. I Googled them and it’s a pumpkin seed!!! I think this is funny. This entire time I was under the impression that it’s a staple of a Mexican kitchen. I will probably buy a pumpkin for this salad and toast the seeds. That should keep me entertained. Hi Anna — Pepitas are hulled pumpkin seeds. They have that outer white part removed. The inside is crackly and light. I find them delightful to snack on (especially if they’re puffy and light — like a Rice Krispie! — after roasting). If you can find them, you can always roast the seeds from your butternut squash (suggested in an earlier comment) as you would pumpkin seeds and use them. Less wasteful, too! Farro is so healthy, this looks like a great side dish for Thanksgiving, in my opinion, even if it’s not traditional. And I totally do have ulterior motives for healthy thanksgiving sides. I love pepitas, too! I also cannot wait to get my pre-ordered copy! Sounds outstanding!! Getting very into roasted veggies + grains + nuts + cheese for filling, healthy, yummy lunches. This is a wonderful one to add to my rotation. Thanks Deb! Lovely salad, Deb. Your squash pieces/cubes are so perfect! Whenever I slice into a butternut, it’s far from perfect. They are so heavy and hard to whack through, no matter how sharp or big my knife is! I love the pepitas idea with the butternut! 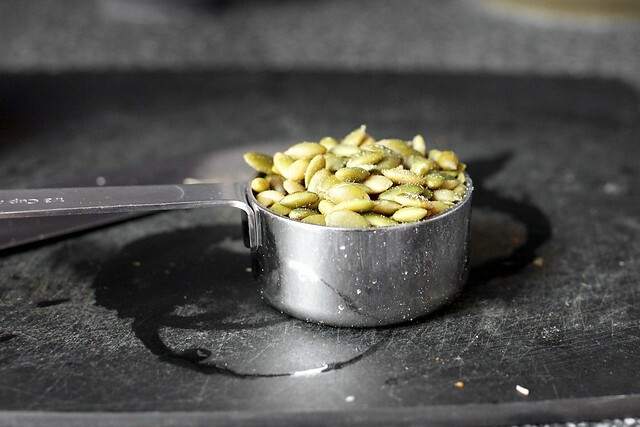 Love pepitas – the crackling they make when you roast them. I agree that grain (seed) salads are best when they’re the crowning glory, not the main event. I can’t wait to make this. And….can’t wait for your book! This would be a treat I know I wouldn’t have to share with the man making it all the better. Butternut is my fave of all squash and adding a salty crumble cheese to it would be heaven on my taste buds! This looks amazing. I keep trying to put off cooking squash so that I like it well into winter, but this may have done it. Also, this is embarrassing, but I saw you and your adorable family in the East Village on Saturday – we were leaving a late thai lunch to head up to the Columbus in the Livingroom exhibit (totally cool) and saw you all walking by. My boyfriend restrained me from rushing up to you and gushing, saving my dignity, for now. Will have to find you at one of your signings to gush in a more socially appropriate space, because you are amazing. We made your chicken soup (jacked it up with lemongrass, lime, soy sauce, and ginger – replaced egg noddles with rice noodles) and apple tart (‘accidentally’ made the caramel super dark) this weekend. Amazing. casey — Aw! You should say hi! This looks great. Looking forward to getting your book. I saw you in HGTV Magazine. Loved your idea using Lyle’s Golden Syrup on pancakes etc. I tried it on waffles and it was very good. Nice and light. So glad I found the squeeze bottle version, although not as pretty as the can. I was reading a copy of House & Home (I believe that is what it is called – Canadian home dec mag that you can buy in Target/Chicago) last night and they selected your cookbook as one of the three best of the year to buy – you, Ottolenghi, and Boulud. You are keeping some pretty good company these days! So happy for you! Deb, thank you for this recipe, it totally inspired my lunch! I had half a butternut squash in the refrigerator. I didn’t have farro, but I had quinoa. I didn’t have ricotta but I had goat cheese. I didn’t have pepitas but I had walnuts. I also added some apple and celery, and roasted the onion instead of picking it. In the end, a totally different salad that was absolutely inspired by yours. And it was delicious! Just reading Casey’s comment above and I am wondering if you are you ready for the outpouring of emotion from your fans? I, for one, am very excited to meet you at the Brooklyn Kitchen in Dec!!! And, almost as excited to make this salad. I got sick as a dog right before an expensive and non-refundable vacation in 2010, so I have a little sense of your ill-timing angst. I managed to shake my regular-old cold in time; hopefully your bronchitis will abate as well! My advice: lots of zinc (Cold-Eaze lozenges, available at your local Duane Reade), hot echinacea tea, spicy chicken soup (Thai soups are great) and most of all, sleep. That last one is the most critical but probably the hardest to manage! Good luck getting well. This recipe looks great, and reminds me a little of a Bittman favorite, the southwestern variation of the sweet potato and quinoa salad: http://content.markbittman.com/recipes/sweet-potato-and-quinoa-salad. I have farro at home so I will have to give this a shot as well. Farro is by far my favorite cereal. Delicious, versatile, low in calories, and full of precious nutrients. Paired with butternut squash and pepitas it just becomes even more awesome. Can’t wait to try this dish! I’m eating this now! Well a UK-cupboard friendly version. Roast Sweet potatoes and cherry tomatoes, buckwheat, feta, pine nuts. It’s incredible. I love onions like this! Thanks again Deb. I know what I’m doing with that butternut squash sitting on my counter….looks delightful. And perfect for a fall day. Preeetttty sure this will be my lunch from now until April. It looks magical. Do you have a squash peeling technique to share? Whatever I’m doing, I’m doing it wrong because it takes forever and I get hand cramps. Leanne — I love using a good, sturdy Y-peeler. Mine is from OXO. If one peeling doesn’t take off all the skin, I peel it a second time. I don’t find it any trouble, thought the squash you see here actually had ridges, closer to an acorn squash (I hadn’t seen that before). Even that peeled easily, though. Misha — Thank you. I am lucky in that I don’t have a cold or fever. I’m just sort of spent easily. When I was still in denial I was sick, I tried to go running twice last week and couldn’t figure out why I felt like my lungs were going to leave my body after 1 minute 30 seconds. (Usually this takes 2 minutes. I kid.) Maybe Jacob will make me some soup? Nancy — Aw. I look forward to meeting you too! Yum!! I was very excited to see your delicious cookbook in the bookstore this past weekend (Canada). Mouthwatering, it is. What a delight! This recipe sounds awesome. Looks wonderful. This is definitely on my list this fall! This is not about this recipe, this is about your book. It is a birthday present for me and pre-ordered and I cannot wait for its arrival. Great minds think alike! :) Just made a farro-butternut squash-walnut dish last night…it called for goat cheese but alas, we didn’t have any. Would have put it over the top. I love this combination, so healthy and autumnal! I hope to meet you in Boston! Oh My Yum!!! I made this tonight. I used shallots intead of red onion and feta cheese instead of ricotta. I am in mouth heaven!!! Thank you thank you thank you! This is on tomorrow’s menu, without a doubt. My lunch has started to feel too routine, which leaves me extra appreciative of your inspiration! I’ve been playing around with pepitas quite a bit too, lately, so this is perfect. Thank you, Deb. Holy Cow is this ever good!! Made it for dinner tonight and my husband said its his new favorite (we like hearty salads in our house). I did make changes, based on what I had available: 1 1/2 c cooked barley (instead of farro), 1/4 c sunflower seeds (instead of pepitas), shallots instead of red onion, and 1/2 oz soft goat cheese. I also cut the evoo in half (2 T) and added 1 1/2 c baby spinach to add some ‘freshness’ and 1/2 c fresh cilantro for some zing. Delish!! This will be in heavy rotation and I promise to make it as written as soon as possible. Thanks for a great recipe! What a gorgeous salad! I would never consider that on my plate as a penance, but as a celebration of good and delicious food. Can’t wait to try it. I made this tonight and it was tasty. A few things: I must’ve added too much olive oil to my butternut squash because it was VERY mushy in the end. I used bulgur as the grain and roasted the bs seeds although I should’ve roasted them longer. Added greek feta, the onion mixture and voila! Dinner! This looks Wonderful! I love farro, and that salad looks like the perfect combination of lovely flavors/textures/colors – oh my! Thanks for sharing! Farro is a fantastic base. I find that this formula of: farro + roasted vegetable + salty cheese + toasted nut + viniagrette + fresh herbs= grainy awesomeness. My go-to is cauliflower, goat, pine nuts, canelli beans, lemon/oil/parsley… I can’t wait to try this butternut squash combination. Perhaps a chili/lime viniagrette might be nice with it? Oh, I believe you when you say you eat salads like that for lunch just because you like it! People don’t believe me either when I tell them I eat beets for breakfast. And I almost always finish the day with a good dessert, like a cookie or a piece of cake. Everything is good in moderation and when made from whole ingredients. What you have on your photos is pure deliciousness! Oh my goodness. I cooked this up tonight with barley/brown rice instead and cooked the pickled onions (as I had read in a Mexican recipe) with the same ingredients. Thanks so much. Fabulousness. Also made the pumpkin rolls recently and can’t get them out of my mind. Must.make.again. Looks and sounds delicious. I love farro and grain salads. I have never tried one with butternut squash. I will have to try it. Thanks for the post and the beautiful pictures. This recipe incorporates some of my favorite foods – squash, farro, and ricotta! Thanks for sharing, I will be trying it soon! Thanks for this, and the suggestion on the OXO peeler! I find that the skin on my hands gets really irritated when I peel a butternut squash – does anyone have any suggestions on how to combat that? I’ve been, er, (assuming confession mode here) leaving the skin on winter squashes lately, especially sugar pumpkins and butternut squash. Wondering what you think of this? 1. I find that if I microwave a winter squash for, say, two minutes, it softens it up just enough to make peeling and cutting it up a whole lot easier. 2. I like almost any bitter green in this, but spinach and/or chard are my favorites. 3. Barley works really well, too. This looks amazing! One of my favorite fall dishes in quinoa, caramelized onions and mushrooms, fresh sage and roasted butternut squash, but the farro would definitely be more hearty and toothsome than quinoa. Also – SO EXCITED to receive your cookbook in the mail – I have been counting down the weeks since I ordered it the day it was available for preorder! This looks suspiciously like the spicy butternut squash, lentil, and goat cheese with mint salad you put up a long time ago. Which I am completely addicted to. So I’m happy to have a different version- especially with farro because it makes me feel like the biggest foodie expert chef person in my tiny ghetto kitchen. Thanks Deb!! Lovelovelove grainy salads, especially when squash is involved! Great minds think alike :) I say all the time I don’t diet (or budget really) when it comes to food. I just like to eat food thats tasty! It just seems like delicious food that you make youself ends being delicious, not-bad-for-you and cost effective. Oh Deb! My Jacob has the same airplane jammies! We love miniBoden around here. Stuff lasts through multiple boys :) Also, made the salted caramel apple awesomeness for parent ed night and it was a hit with every mom at preschool … all of whom, by the way, knew exactly who you were and what it was!! Smitten Bonding. I have a bag of wheat berried from my CSA – do you think they could go in for farro? Seems like. It looks so delicious! I love cooking and I can’t wait to make this too, it’s healthy and it seems tasty! I love roasted vegetables, especially butternut squash. Farro is chewey but OK. Normally I find your combinations interesting, but I think I may be with Jacob on this one. Sorry but that bowl of “goodness” just doesn’t do it for me. Hope you get to feeling better before you set off on the tour. Fresh dates are delicious in this salad. Congrats on the book! I love your recipes and can’t wait to get a copy….so check one off the list as sold. I’ve been wanting to play with pepitas and this looks like a very yummy way. Thanks for sharing! Oh yeah! I love these kind of salads, they’re so forgiving. The first recipe I had was for pearl barley with roasted squash, green beans, goat’s cheese, and it had a dressing with honey in. At the moment I’m pretty fixated on including beetroot, which turns all the other ingredients such a fab shade of pink, and I really want to put in grilled halloumi with everything. I was so excited to see your book listed in Better Homes and Gardens as a must read! Yours is one of my very favorite of the food blogs I read, and I can’t wait to come to your signing in Philadelphia. Good luck, and feel better! @Wendy: I try to minimize contact with the squash as I’m peeling it because there are enzymes in the peeled part that irritate and seem to coat the skin. It is a weird reaction because you can’t wash off the coating, just have to wait for it to wear off. Since you do have to hold on to the squash to peel it, my idea is to coat my hands first with olive or coconut oil, and then peel the squash. A lot of people have a skin reaction to orange squashes and mangos! EM-MV, Wendy — So funny that you mention this because in all of my years of peeling butternut squash this way, this was the first time I got that film on me! It was very odd, like dried Elmer’s glue but it was hard to wash off. It did not irritate my skin, but I scrubbed at it a little to get it off. As I said, this is the first time it has ever happened (I’ve peeled butternuts every winter, multiple times), so I don’t think it counts for all of them, but I’m glad it’s not just me. I thought something weird was happening. 6512 and growing — There is no reason you cannot eat the skin but my impression is that most people don’t care for it because it can get a bit tough, more so than acorn and other squash. oh, you poor dear! feel better, very much better, soon. in the meantime, thank you, THANK YOU for this salad. this is exactly my preferred way of veg/grain salads — heavy on the former, light on the latter — and i think the ricotta salata brilliant. i give it a week before it makes its way to our table. I’ve been searching for new things to do with the bulk farro and wheatberries in my pantry. Thank you for this one. It looks delicious and like one of those recipes that’s great with dinner but better the next day standing in front of the fridge eating while looking for lunch. I get an email from Amazon daily – today it is promoting cookbooks and yours is one of them!! Hope it sells, sells, sells! Delicious and healthy? You have me hooked! And this recipe will be so simple to edit and make vegan friendly. I can’t wait to try it! Perfect timing — my fridge is full of random leftover ingredients from a weekend of recipe testing. Half a roasted kabocha squash (pumpkin empanadas), feta cheese (kale-feta-pomegranate salad), cracked wheat berries (breakfast porridge)… Delicious way to use them up. Looks and sounds yummy! I made something similar using delicata squash, but the flavor and depth of butternut squash is unbeatable. Looking forward to your book! Thank you, Deb! Perfect timing! I had half a butternut squash and a couple of sweet potatoes begging to be eaten so I used them in this recipe last night. I made a few substitutions and used barley, pistachios and goat cheese. Delicious! A perfect fall meal. This sounds delicious! Whenever I feel something coming on, I load up on an obnoxiously large amount of garlic and hot, spicy Indian food – seems to kick it right out of me! Healthy wishes! LOve pepitas! Enjoyed fruit stand style squash all day, today will make squash spice bread to go with my riesling grape jelly. Looks yum! On another note, any plans of doing a second TORONTO event? The larger venue is already sold out with a long waiting list! I’m so sad that I won’t get to meet you after years of following your blog. Hi NKB — I hadn’t realized, so sorry. Is the larger venue sold out too? It had been moved after the first venue wasn’t big enough. I can’t wait to try this recipe, this is the way I like to eat. I agree with you about grains being the accent. As much as I love grains, I hate it when the salad is a bowl full of grain with little bits of other stuff. I feel the same way about pasta salads. Keep these kinds of recipes coming please. Made a riff on this today with sweet potatoes and quinoa, because I accidentally bought $20 worth of it in bulk and am slowly working my way through it. Mixed it up with some red wine vinegar, a little maple syrup, and Sriracha (because I have a problem) instead. Topped it with feta, dried cherries, toasted, salted pepitas, and some chia seeds, and omitted the red onion. Served it over fresh spinach. Thanks, as always, for the inspiration, Deb! It’s delicious. Deb, I am SO HAPPY that it seems our cooking preferences are trending in similar directions (‘cuz in my mind, you and I are friends, and thus easily an “our”)…this looks delicious, and I’ve been trying to find new vegetarian and grain recipes recently. Yum. And thank you! I’m looking forward to trying this. Also? You poor dear: bronchitis just before having a baby–I mean, cookbook–sounds lousy. I love butternut squash. Combination sounds very wonderful.Will try it this week.Get better soon and do get some rest. Made this today! Delicious. The idea of using the grain as a crouton is genius!! I used walnuts…and the intermittent bites of nut and pickled onion were so yummy! Thanks for sharing this recipe…going to preorder your book right now!! This is perfect! Nobody else in my house likes winter squash, and I was just thinking that I needed some sort of winter squash dish I could make ahead for lunches that would keep well. Ding ding ding, I found it! I just made this in a wheatberry variation! This recipe was meant to come my way as my last csa box contained buttercup squash, red onions and kale which I steamed and added, too. Toasted walnuts, feta and maybe a hardboiled egg will finish this off, all without having to leave my apartment, sweet! I’m very put off by raw onions, however, I think one of the greatest lesson I’ve learned from smitten kitchen is to use those quickly pickled red onions often and everywhere. They are transformative! Thanks and good luck with your book tour! i love farro but have trouble finding it in NYC grocery stores. do you all have a suggestion for where to shop? when i order it online, the added shipping costs can make it very expensive! mary — They sell it at Whole Foods, I think in the open bins. But it might be worth calling before you make a trip to confirm. And I think I got the slow-cooking stuff from Fresh Direct from a nice brand, and really, the extra 20 minutes simmering was not the end of the world. Looks like I’m going to have to make this as a side dish for Thanksgiving! I’ve been looking for dishes I can make ahead of time because I absolutely hate feeling frazzled the day of the feast. Turkey is enough stress for one day. @mary – 4th street coop b/t 2nd and 3rd has farro and all sorts of hard to find stuff. I work a shift every week just to find out about all the new ingredients Ive never even heard of. Maitake mushrooms, dried mulberries and pink pearl apples that are pink and swirly inside were some of my favorites the last couple weeks. But how do you tell if the farro is pearled or not? I brought some home but am not sure how to get at it yet! I like your theory on grain:vege ratio, I think that may make future grain salads more interesting for me… can’t wait to try this one, thanks! That doesn’t look like apology food to me, it looks amazing! Roasted vegetables are some of those rare but delicious healthy foods, and I happily eat them all the time without feeling deprived. This salad is beautiful, and it’s definitely going on my list of recipes to try. Love your site and photos, by the way! I made a salad similar to this (with no formal recipe) and I use pomegranate molasses in the dressing. It gives the salad a very elusive spicy flavor. This sounds delicious! I’ve been trying to eat more seasonal dishes, instead of “I’ve got into habit of making this” dishes, so I can’t wait to try it. In other news, I just opened my November issue of Better Homes & Gardens and GUESS WHOSE COOKBOOK is highlighted on page 12?!?! So exciting!! What perfect autumn flavors. I can’t wait to try this! This sounds like a great dish. I have a similar one with wilted spinach I make in summers. The butternut squash would totally get me in the fall mood. Am I the only one that cuts squash in half, seeds it, rubs olive oil on the flesh, roasts it, and THEN cuts it? It takes longer to cook but infinitely easier. Wendy, EM-MV, and Deb – there is an enzyme in butternut squash that causes the skin-tightening reaction. I apparently have the severe form of allergy, since my fingers went numb, blistered, and the skin actually peeled off my hands. The enzymes are actually used in chemical peels, and occur more often in fresh young squash (it’s a self-defense mechanism for the squash to prevent it from getting eaten until it’s fully ripe and can reproduce). Usually the flesh of the squash is safe to eat because it’s a contact allergy, not an ingestion allergy. (Although sadly I turned out to be allergic to the flesh as well). I just so happen to have a little packet of freekeh in my cupboard I’ve been wondering what to do with, and some home made ricotta (not salata, but oh well) in the freezer. Thanks for another amazing recipe! Just made & polished off a bowl of this salad for lunch here in Dublin, a very satisfying salad for these chilly autumn days ;-) Thanks so much !! I made this last night and holy eff, it was amazing! I added a sliced apple and dried cranberries. I also went with goat cheese instead of ricotta salata. And when I roasted the squash I added a little cumin, coriander and cayenne. So good. I’ve never made farro but I’ve had it in a ton of salads and chic restaurants, so I feel like I need to make it if I want my kitchen to feel like a chic restaurant :) I am always leery of grain salads because so many times it’s just boring health food with a cool name, but you sold me on this! I will definitely try! re 94: Wholey Pepitas Deb!! Over 5 million hits per month??? Yowza! I made this last night – it is divine! AND will go into regular rotation—thanks Deb. I love anything with pepitas! Thank you for the recipe – will be making this weekend!! Goodness gracious, this looks good. Love the combo of flavors! This looks amazing! I have been wanting to try farro at home for a while but haven’t really haven’t been inspired… but pairing it with butternut squash (one of my favorites) and a salty cheese–yes please! Cannot wait to try this. Thanks for broadening my cooking horizons yet again! Also Congrats on the Buzzfeed shout out! I saw this dish in the “21 Delicious things To Do with Pumpkin Seeds” article. They all looked yummy but yours definitely looked the best. Ok, so of course the recipe looks WONDERFUL and I’ve got the stuff for it and can’t wait to try it but even MORE important is that you’ll be coming to MY HOMETOWN for book signing! I just figured you wouldn’t be heading this far south (Houston) and never even checked. For grins and chuckles I did and there you are! Very excited! And gratefull that I looked before you had come and gone! This is a nice hearty bowl of salad. This will be a good way to help me watch my weight during winter. Made this for dinner tonight….perfect! Used feta, but everything else pretty much the same. Loved the sweet, tangy, and chewy of it. Will definitely be on the weeknight quick-and-easy dinner rotation. I just made this the other night – it was great, I received many compliments! I had to be creative with ingredients – used millet and feta, and added some dried cranberries! I also made Alex’s chicken and mushroom marsala and the salted caramel apple tart for dessert – a total Smitten Kitchen meal (with green salad thrown in too). Amazing! Thanks for all the great inspiration! I found farro in an Italian import store and the english translation was “spelt”. Quite similar to barley, with it’s little dimply line, in texture. Yummy! Does it make me weird that I was watching the news this morning about Hurricane Sandy and one of my first thoughts (after “I have to pick up some stuff in case the power goes out”) was “I hope this doesn’t mess with Deb’s book events”. Beautiful Salad! I will be using this as a side dish for dinner parties! Anita S – me too! Hi Deb – just wondering where we sould keep an eye on for any announcement about changes for Tuesday evening, since that’s when this storm is supposed to be at its fiercest in NYC. Lucy — I hope it doesn’t come to that but I will absolutely post it on the Events & Book Tour page and very likely mention it on Twitter or Facebook. Anita S. — Aw! Yes, I just became aware of it last night and will be totally heartbroken if it messes up Tuesday night’s event in NYC [… Also, if it harms people or places along the way. Because, you know, perspective. :) ] We’re all so excited about this as I’ve waited so many years to finally be able to get out and meet people and we picked the biggest venue we could get and were careful to avoid scheduling it on Halloween etc. etc. I will be back in the city in December and there will be other NY events. But I would be happiest to kick it off with a big one the day the book comes out. It is dangerous to read this site while sitting in jury duty. Now all I want is this for lunch. right now. Will have to make it this weekend. please take care of yourself… Get better.. And hope that the Frankenstorm reports are an exaggeration, but fear not.. Neither rain, nor storm,nor sleet,nor gloom of night shall stay you and your fans from the swift completion of your book tour..can’t wait. I made this last night. I so prefer when people comment because they made the recipe! :) It was great. 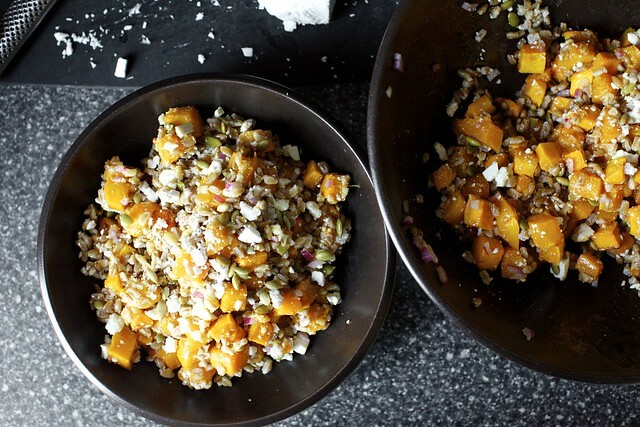 You had me at farro and butternut squash. Two of my favorite food items! Can’t wait for the cookbook! You would think that in Switzerland, the land of cheese, i’d be able to find a salty ricotta. But no…. Feta had to suffice, and it did – wonderfully! I also used wheat berries because that was what i had (i’ve gone to grinding all my own flour) and that was super tasty. Love this recipe! I also live in a ricotta salata-less world, so I went with feta. Totally amazing salad! I made some subs/additions based on the contents of my fridge and they were delicious so I thought I’d share: added beets which I roasted along side the squash. Used balsamic for pickling the onions and added fresh thyme to the vinegar mix for pickling. Also used barley. Thanks for lovely keeper recipe! I made this yesterday and WOW! I have a new favorite lunch/dinner for the fall! I substituted feta, but otherwise I followed the recipe to a tee! It was lovely and the pickled onions make the dish so don’t skip them! Thanks for another awesome recipe Deb! I can’t wait for your book! Hi Deb! This salad looks amazing! I was just wondering though — do you eat the leftovers cold, or heat them up? Shannon did you use barley instead of farro or in addition to farro? Making this as we speak!! So far everything looks like the pics above. I have been thinking of this dish all week. DELICIOUS!! Just made this with quinoa, feta, roasted pumpkin seeds and followed the recipe for everything else. Simple to make this and it’s a keeper! It was a Deb Dinner here tonight: we made this delicious salad (with Kabocha squash and feta) AND the chard/white bean/pancetta pot pies (dee-vine). “Where did you get these recipes, Diane?” So it was ALL about smitten kitchen at the dinner table tonight and I guarantee a few more fans. :) Thanks for another wonderful meal! Do you have a stuffed pumpkin/winter squash recipe that you like? I’ve been really into quinoa lately, so maybe I’ll give this recipe a spin with it. Hope your bronchitis has cleared up! Just made it am looking forward to lunch on Monday! Can’t believe I just wrote that. Used apple cider vinegar because that is what I had, turned out very bright flavored. Any tasty make ahead / pack lunch is worth it’s weight in gold, thank you! Made this exactly as the recipe calls, and it was delicious! Absolutely loved it (and it helped me ignore Hurricane Sandy, an added bonus!) Thank you! What a great recipe! Perfect warm squash/grain/cheese combination in preparation for the storm! (Although it seems to be hard to find farro, so hulled barley had to suffice. I’ll be trying it again once I find it. This is absolutely my kind of salad! Mega yum. Hope that cough has left you by now, Deb. Cannot wait to receive your book in the mail! This salad rocks! I made this with barley instead of farro and roasted sweet potato instead of butternut squash but kept the rest exactly the same – I couldn’t stop eating it!!!!! Thanks for this one. I can’t wait to try it! Too bad all the groceries stores in NYC have been cleaned out. I guess I’ll have to wait until Sandy passes through! I made this with unripe spelt grains, which are my favourite grains, and it was absolutely delicious, even though I roasted the squash too long. Especially warm it was the perfect fall food. Made this on Saturday night for a dinner party to rave reviews — we liked it so much that I made it again on Sunday night! I followed the recipe exactly except that I used feta cheese. Had a difficult time finding Farro at Whole Foods – I thought it would be in the bulk section, but it was pre-packaged in a different aisle near the rice. There were two types of farro, so make sure to look at the package and try to buy the one that only takes 30 minutes to cook! try the farro salad at bar corvo in prospect heights. similar ingredients, crazy delicious. Love this! I made this twice over the weekend, once for a Halloween party, and then again the next day so I had some for this week. It got rave reviews at the party. I made it as written the first time, and the second time roasted the onions along with the squash and then tossed it all with a homemade vinaigrette. Wow! I really loved the carmelized onions with it. Thanks for posting. This is a great Fall grain salad. I made this over the weekend & it was an enormous hit! I couldn’t find farro, but my store had wheat berries, so I subbed those. I made extra, because I thought it sounded so good, & I’m glad I did, we both took leftovers for lunch Monday! Thanks for another awesome recipe! I’ll be making this again soon! Oh, and coconut vinegar, didn’t have sherry. I just made this as an accompaniment to oven-baked cod with thyme and fennel, and it was awesome. I adapted using barley instead of farro (had trouble finding farro – the first time looking for it here in Berlin), and added black sesame seeds in with the pepitas. I tossed the pepitas in smoked paprika, a touch of cumin, salt, pepper and a gentle teaspoon of brown sugar before roasting – and I loved how it incorporated a little sweetness in their crunch. I also couldn’t find ricotta salata but got a fresh mild-yet-salty crumbly sheep’s cheese which worked out nicely. The pickled red onion plus vinegar-y dressing seemed a smidge too tangy for my taste, so I’ll adjust the brine and dressing proportions in the future. That said, it went over very well in this house and I look forward to all the leftovers! Wow! Delicious! I made this with substitutes of quinoa, goat cheese, walnuts, and apple cider vinegar (gluten-free + whatever I had around). It is temptingly tasty. Thanks Deb! Deb: I was on my iPad Monday evening when I received an email from Apple telling me that I could download your cookbook that I had per ordered. I have only made it though the first 30 pages, it is amazing. Love the photos of Jacob. Can’t wait ti make the sour cream peach pancakes this weekend. Congratulations, your book is as great as I thought it would be. Be safe in NYC, you and your family are in our hearts and prayers. Delicious! I didn’t have any farro around so I made it with bulgur and added currants. I love how light and seasonal it is, Thanks for sharing! Oh I can’t wait to check out your book! Wish you were coming to Colorado! I made this for dinner two nights ago and while we were still eating my son and I were fighting over who would get the leftovers for lunch the next day. It was delicious. Thank you. So delicious! I literally cannot stop eating it out of the big bowl I just mixed it in. Thank you! Just made this tonight with the butternut squash from my last CSA pick-up of the season – ABSOLUTELY FABULOUS! It was everything I hoped it would be and more. One of those great recipes that exceeds the sum of its parts. My gourmet cheese counter for whatever reason was out of ricotta salata but I had some manchego in the fridge so I used that instead and it was delicious. The combination, in fact, was so good that it has inspired a butternut squash-manchego caprese-style appetizer that I’m making for a cocktail party this weekend! This salad will be a staple during the winter months when squash is in season (and I’ll pine for it during the summer)! This was great. I brought it to a potluck and several people asked for the recipe. I used wheatberries instead of farro, and feta instead of ricotta salata. Because of what I had lying around, I made substitutions for almost everything: orzo instead of farro, toasted almonds instead of pepitas, a shallot for the onion, and feta instead of ricotta. It turned out excellent! Awesome recipe!! Great fall salad!! Gonna make this for dinner tomorrow night! Thank you for sharing! Love the shot of the butternut squash – such an hourglass shape and half undressed. Great treatment of this voluptuous veggie! The spiced squash and lentil dish you featured 2 years ago is probably the dish I have made most frequently from this site. I think I made three batches of it out of the halloween pumpkin my husband brought home from work that year, I loved it so much! I made it on the fly with a deadline recently and learned that cubed and roasted, you can totally get away with not peeling butternut. I also cut my roasting time by microwaving the squash first, though I recall you do without one to save space. I look forward to trying this one or maybe combining elements of both. Can you suggest a good knife and peeler for handling butternut squash and other squashes? Hi Neta — I use a Y-peeler (I link to it in Comment #62) and think any chef’s knife will do. You just want it very sharp. I simply must bow down and humbly say that your photographs truly capture the pure beauty of your ingredients used and tell the store of good gorgeous food. I am exciting to follow your site and trying out your recipes. Again, your photos capture the soul of good cooking and food. Bravo! I love farro and we happened to have a butternut squash on hand from our weekly CSA box. This recipe is dynamite. Simple ingredients and great flavor. BTW – my favorite trick for cutting hard winter squashes in half is to use a rubber mallet to pound the chefs knife through the center. Fantastic salad. My butternut squash got a little blackened where my oven is hotter on one side. Those little sweet carmelized bits of squash were the best. I am going to make this again and make sure I caramelize the squash a bit. Thanks! I made this today and it made me soooo happy. Subbed Wheatberries (I had some cooked and in the freezer) and sunflower seeds (cause they were in the pantry wondering if I was ever going to use them.) DANKE! I’m eating this right now and it’s rockin’ my socks! Thank you so much!!! I made this tonight. Well sort of. I had some barley I wanted to use up so substituted that for the farro. And I forgot to buy a red onion, so I used a yellow one instead. Oh, and I don’t think I’ve ever heard of ricotta salata so I substituted goat cheese. And while I have 19 different vinegars, not one of them was sherry vinegar, but I figured if I brought one more home my husband would have me committed so I used red wine vinegar. And I used twice as many pepitas because my kids really like them, but they weren’t toasted so I toasted them on the stovetop in a bit of butter. Other than that, exactly the same recipe. I can only imagine how good it would be if I ever learned to FOLLOW a recipe! I just made this and used your advice on using the recipe as a template. After switching quinoa and goat cheese for the other ingredients, I can say this definitely tastes great warm or cold! I would like to know if roasting the butternut squash would be the same as baking it? Carol — It usually refers to a higher baking temperature, but essentially, yes. This is exactly my kind of dish…I added sauteed mushrooms and kale to fill it out for a full meal. And snuck some kalamata olives onto my plate. Really great flavor pairings! Thank you, Deb, and congratulations on your book! Your postings are as fun to read as the recipes are delicious, so the book can only be great. I am so disappointed to have missed your visit to Vancouver – I had the dates mixed up in my mind and thought it was this coming week! :( So I made this recipe with most of the ingredients listed (but with feta in place of the ricotta). I have to say, it’s the first Smitten Kitchen recipe that didn’t enthrall me. I think that’s more about the fact that I am still warming up to farro; this is the second or third recipe I’ve made with it and I’ve yet to fall in love. I think I’m just a pleb when it comes to ancient grains…. I recently made your roasted tomato soup with cheddar cheese toasts and it was incredible. And I spent last night tucked up on sofa drooling over the many fantastic-sounding recipes in your new book. Chickpea salad with sumac? I’m there!! Congratulations on the launch of your cookbook! Used wheatberries and added pomegranate arils for an extra bit of tart-sweetness in the face of a particularly extra-strong onion. Great recipe! OK, so I went to our local Co-op yesterday and ate this delicious salad they were serving samples of called Roasted Butternut Squash Salad with Farro and Pepitas. I posted the pics on Facebook and was super proud of myself because the didn’t have the semi-pearled farro so I got out my pressure cooker and made it that way so I didn’t have to soak it overnight and then cook the snot out of it. I had NEVER seen your website or heard of you. Then today I was perusing Pioneer Woman’s website, saw your cookbook and website, looked your cookbook up on Amazon (which I will now buy) and then was looking through your website and saw THIS RECIPE!!!! CRAZY! Thanks so much! You rule! I loveloveLOVE your site. The way you write, the pictures, the recipes, everything! Can’t wait to get my hands on your book. One thing though, my bout of browsing here got severely shook up because of a very loud video advertisement at the bottom of the posts at the moment! Took me a good few minutes to figure out what page was making that awful noise! Eeek! cableclair — Yuck! I’ll see about getting it removed. Thanksgiving and the holidays always bring a fresh batch of new overeager advertisers, not all who play by the rules (as a rule, I don’t want any auto-volume or pop-up ads on the site but they sneak in, I know; I remove them when I see them). Deb, this is amazing!! I made it for supper tonight, using quinoa as the grain, and it tastes like…Thanksgiving. And being a grad student headed toward finals, I can’t tell you how much I love having nutritious comfort food that I can eat every day for a week. Great recipe as usual. I did change one thing though, instead of peeling the squash raw I put the entire squash in the oven on 300 for 10 minutes peeling it was a breeze and I didn’t feel like a butcher cutting up a hog. Thanks for this! Just made it this afternoon – will be the perfect lunch for the next week! Thank you Deb!! Ditto on cableclaire’s first paragraph! I made this tonight with ingredients on hand – spelt instead of farro, acorn squash instead of butternut, apple cider vinegar instead of sherry, no feta, white onion instead of red, overlooked the Tbsp water (no harm done, as far as I’m aware). Very tasty, mine could have used more salt but this probably would have been addressed with the feta. Hope the book launch is going splendidly for you!! wowza, this was amazing! I love farro and butternut sqaush, and the seeds ( I subbed sliced and toasted almonds) and pickled onion gave it such great texture and flavor. I added some flat leaf parsley, mostly for the color. accidentally over-salted my farro, but it balanced out when I added the rest of the ingredients. Lovely fall dish, here’s hoping my coworkers love it as much as I do at our pot luck tomorrow! I cooked a lot of your recipes and loved all of them. This one I could take a bath in it like us Germans would say. Just bought your book for my Kindle and the hard copy and of course I am very, very happy with it. You are AWESOME!!! Thank you very much for your wonderful blog and congratulation to your outstanding book! I made this for Thanksgiving and again for dinner tonight 3 days later. Followed this recipe pretty closely but used shallots instead of red onion and had fresh feta in the fridge so swapped that in as well. Will try goat cheese next time.Thank you!! Will be making this often. Such a perfect recipe, and so easy to change throughout the year with seasonal vegetables. This was a big hit at thanksgiving- among some pretty picky eaters mind you. Some of my in-laws looked at it funny because its a room temperature (and unfamiliar) dish amongst all the traditional hot thanksgiving sides, but by the end of the day after thanksgiving the entire salad was nearly gone! I doubled the recipe too. I made it as directed but added craisins. I was shopping at our local co-op and someone had made this salad for sampling and after I tried it, I went crazy-bananas for it and rushed around the store looking for ingredients for it. At the bottom, it credited your website for the recipe and now I love your blog! It took me a long time to make (I’m not experienced in squash peeling and I had to figure out my pressure cooker to cook the farro), but I was in hog heaven eating it AND my husband ate it AND the baby (he’s almost 2, but MY baby). He kept signing “more, more” – and the baby did too (haha). Anyway, I will be making this again and I posted a picture on Facebook, and even though my friend said it looked gross, I was so proud of it! Thank you so much! I made this as a Thanksgiving side dish last week. It was very tasty but a little dry. Afterward I swirled together a little olive oil & lemon juice and stirred it in, which definitely helped. I like the craisin idea as well. Overall a great recipe, and very much in line with my recent butternut squash crush! Just received your book in the mail and I will be sleeping through the theatre tonight because I am not taking a nap!!!!!! I just made this (with quinoa) and was surprised at just how much flavor it has. The quick pickling of the onions really sets it apart. One question – where would you find farro in a grocery store? Is it a grain? A legume? is is now my winter go to…served it multiple times since October to rave reviews! I mix it with arugula for more green and make a simple sherry vinegar Dijon olive oil vinagerette! amazing! Made this tonight with goat cheese and chopped almonds and it was super good. These are my favorite kinds of recipes – decently healthy, adaptable, and keeps well for lunches to take to work. Keep the grain salads coming! This is SO good!Made it for a potluck, and am regretting not having doubled the recipe so we could have some more! I took your suggestion and substituted shallots, and feta-divine! I just plain love this. I can’t even say anything else! Thank you!! I’m moving to NYC this spring, and am looking to sign up for a CSA. The produce that you get always looks beautiful, could you share which CSA you use? Thanks! Deb, I was looking for something I can bring to a potluck dinner this Friday night, and making it ahead was key. I made it this evening. Even without time for longer melding of flavors, it is amazing. It is colorful, has varying textures, some crunch, and it’s pretty healthy. I cheated by buying fresh already-cut squash chunks from an excellent store nearby. I also used barley this time rather than farro, because I had it in the house. Cooked the barley al dente. I can’t wait to serve this, that is, if I don’t eat it all first. My follow up: huge hit, several requests for recipe (faithfully referred to this blog.) Two comments: after a few days in the fridge I felt the salad needed more dressing, so I whisked up a quick additional vinaigrette using lemon juice and I think it further brightened the flavor (which might have been less the case if I’d served the salad closer to the time I made it). Also, the salted pepitas lose their crunch after days of fridge time, so I sprinkled some “new” ones on top before serving. Thanks for this awesomeness. Oh…..my…..gosh!!!! This was amazing!! Flavor packed and great texture…guaranteed to make one go back for a second helping. This is a huge winner in our home and will be made again…..and again…..and again. Will be fun to play around with the recipe as well (as you mentioned). This time around we made it with feta cheese and followed your instructions to the tee. Honestly, food blogs have been my saving grace. I stumbled onto your blog while in search of a farro and butternut squash recipe…..because I had both ingredients on hand. And oila…found you!! Cannot wait to explore your recipes and check out your book. In my eyes all recipe bloggers are goddesses and utterly and completely necessary for the well being of people. So..thank you!!!!! Have made this 4 times since it was posted. And always a batch-and-a-half, just for myself, to eat for lunch the whole week. It is divine! I use feta instead of ricotta, and red wine vinegar instead of sherry which renders it just a little less sweet/more savory and (I think) causes that tart “vinegary” flavor to come through a little more strongly, if that’s what you like. Thank you Deb- it’s truly grain salad perfection! I have this in the fridge ready for Sunday dinner (it will be served alongside a roasted pork loin). For those who have trouble finding farro, Trader Joe’s carries little bags of a “10-minute” farro. I think it’s perfectly acceptable (unlike, say “minute rice”). I sometimes cook mine in chicken or vegetable broth for added flavor. Another short cut is to buy pre-cut butternut squash (several nearby groceries offer this now). I generally scoff at pre-cut veggies (does anyone really need help making carrot and celery sticks? ), but I started using the pre-cut squash from time to time after a friend had to go to the ER after a scary squash-cutting accident. And thanks to those who mentioned making this for a potluck. I have a potluck coming up in a couple of weeks and I think I know what I’m making! I just keep making this time and time again! We’re having it for a light dinner tonight before heading out to a concert, and I’ve been dreaming about it all day! I’ll be using toasted sunflower seeds this time around, since my grocery store apparently didn’t have pepitas, but I think they’ll be ok. Since I got beets and carrots in my CSA, I put in those instead of squash and it was a beautiful, crunchy, blood red thing. I blanched the beets/carrots cut into chunks for the last minute of the farro’s cooking time, though frankly, the beets were so sweet I could have skipped this step and it may have even made the salad better. It was still crunchy and awesome. Otherwise I kept the recipe the same. This recipe is a real winner however you do it! Love, love, this dish!! Made no changes to the recipe. It’s perfect as is. This is really really good, and easy! I like the farro, but have also made it with Trader Joe’s couscous grain blend and it was lovely. Thank you, Deb! This is a staple in our dinner rotation. Everyone absolutely loves it. Costco has been carrying farro (yea!) so we always have it in the house. The ricotta salata isn’t always easy to find, so I usually use queso fresco. Yummm! I LOVE this salad! It was my go to dish following chemo treatments, a bowl of comfort. I’ve made it with bulgur, quinoa and barley and loved them all. I also use a raspberry flavoured red wine vinegar and to make it vegan I use a combination of chopped capers and jalapeño stuffed green olives instead of the cheese. I mix the salad in the roasting pan while everything is still warm, and warm leftovers before eating. Thanks for this one. Pure pleasure! This is insanely good. You should make this. Now. Chiming in a year later to say that this is the perfect fall lunch salad. The only change I’d make in the future is to add the pepitas just before eating so they keep their crunch. Also, why has it taken me this long to finally take your advice on lightly pickling the red onions? They are freaking fantastic and add an amazing crunch! I can’t even believe how good this was. I subbed delicata squash (with the skin still on) because I hate cutting the skin off of butternut. And I subbed feta for ricotta. I also added one, chopped chx breast that I baked in a little garlic powder and olive oil. I will definately be making this again, I am normally really critical of how well I can execute recipes or how well things taste – but I honestly had to admit to myself – This turned out AWESOME! A perfect fall salad. Used apple cider vinegar instead of sherry vinegar, added pomegranate seeds and substituted a lovely French goat feta for ricotta. My butternut squash is roasting, as I’m making this recipe a second time. The first time I used goat cheese and toasted walnuts and subbed in a little walnut oil for some of the olive oil at the end. It was divine! This time I’m going to wait to stir in the goat cheese until it has cooled a bit more. And lunch for the week is done! Just made this for dinner, it is absolutely divine!! Will definitely be making this regularly, thanks Deb!!!! This recipe sounds and looks delicious! Can’t wait to try but I was wondering if the sugar I. This recipe is necessary and if so can I substitute it with any other sweetener? Hi Danielle — The sugar is used to lightly pickle the onions — sugar, salt, vinegar and water do this together. To skip it might throw it too salty. You could use another sweetener in its place. This is so good, and SO filling! Everytime I have this, I’m just astounded by how filling squash and farro can be. As someone who struggles to feel full from salad, this and your kale quinoa salad have been great! Thanks! OMG! this was fantastic! it (almost) made up for thanksgiving being cancelled due to flu. i added arugula for a little greenery and it was beautiful with the purple onions and yellow squash. This is so delicious!!! I made it with wild rice instead of farro cause I had it in the pantry. It was really good, and the black rice provided a beautiful contrast to the orange squash. I also used Mexican Cotija cheese and it was great.Thank you for anotherwonderful recipe. I made this dish for an Easter potluck. It was a hit! I made a few modifications: sliced the onions thinly (the strands looked pretty), an additional cup of cooked farro, and an additional tablespoon of sherry vinegar. There once was a girl who had a butternut squash sitting forlornly in her pantry, dutifully holding itself together as winter turned strongly into spring. One day she stumbled across this recipe and fell in love, roasting the squash immediately despite the heat outside. As she scrambled through shelf and bin, she discovered that squash was the only part of this recipe she actually had. She subbed balsamic for sherry vinegar, not pickling a darn thing, pine nuts for pepitas, quinoa for farro, and homemade ricotta for feta. The resulting dish was delicious, and she thanked Deb kindly for the framework and inspiration (and gracious forgiveness of her utter bastardization of the recipe). And.. other than Kalustyan’s, are there any must-go foodie destinations in NYC? C — Thank you. And I recently updated my favorite food-ish list of places to go in NYC. Hope it gives you some ideas. Thanks! I finally tried this recipe, and it was great. Next time I probably would use the whole (3+) lb. 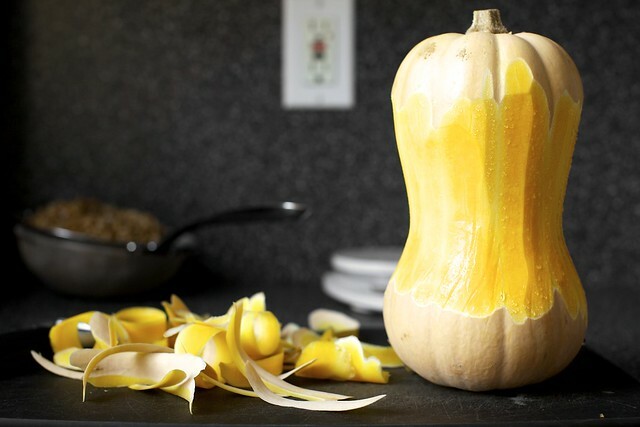 squash, although that pan was already pretty full, and try using all vinegar instead of the water. I ended up adding vinegar, but it’s tricky because too much overwhelms the squash flavor. Thanks for the link. I’m especially looking forward to the quest for yogurt and creme fraiche. Donuts filled to order, you say? You know, when I poked around for an NYC food guide here, I could’ve sworn there was none, but now that you’ve pointed it out, it keeps staring me in the face! I made this last night and it is so delicious. Like autumn in a bowl. I love baking but am not the greatest cook. This was delicious, easy, healthy, very filling, and great as leftovers. My boyfriend who is too often subjected to my botched cooking attempts loved this…too bad for me, it meant fewer leftovers! I used pre-cut butternut squash because that’s all the grocery store had, and my only complaint is I wished I’d cut it into smaller pieces. This will definitely be one I come back to again and again! I didn’t see this or the yummy squash toast on https://smittenkitchen.com/pumpkin-winter-squash-recipes/. Maybe you could add them there? c — Thanks for the tip. Deb – do you have a recommendation for a good brand of sherry vinegar? I don’t use it often and am a little unsure about all of the options. Made this a couple of nights ago amongst other salads for a group of friends on a hot Autumn night in Australia and it was the clear favourite! No leftovers whatsoever – I was rather disappointed. Used barley instead of farro as that’s what I had, and with a sweet potato too. Amazing flavour and textures!! So glad to have found it just as pumpkin season sets in here. Will be a lunch staple over the next month or two. Ah-MAY-Zing!!!! OMG!!!! LOVE THIS RECIPE!!! We doubled the pickled onion thing and I’m glad we did. Love! Gave this a spin after the store only had giant freak 5 pound squash and I only needed 2 pounds for another recipe. I had raw pepitas so I toasted them with a dot of oil and salted them, and I had made bacon in the oven earlier in the day so I used the pre-greased bacon pan to roast my squash instead of tossing with olive oil (though I used oil and not bacon fat for the final dressing). I made it Monday night and had for lunch and dinner on Tuesday, then packed for lunch for myself and hubby again today, and can probably get one more day of lunches out of it. Love, love, love all around for this one! I made this again this year. This time I used 2T white wine vinegar — I liked that much better. Also tried adding some sweetened cranberries — ambivalent about that but also would like to try adding pomegranate seeds, arugula, and/or beets. 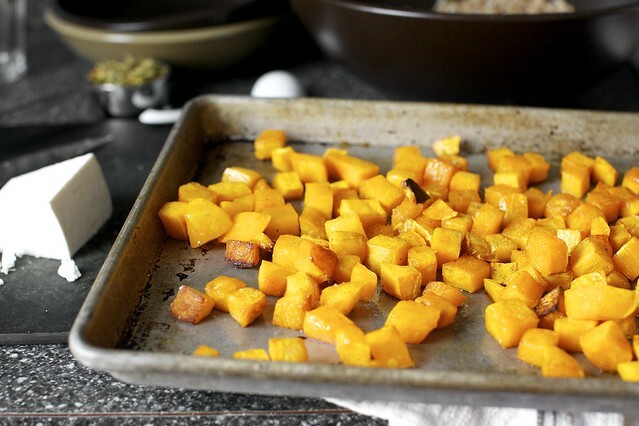 This recipe led to our discovery of honey nut squash! Amazing. It has a richer squash taste than butternut, more like kabocha, but a cooking friendly shape and size. I made this too salty by salting the barley water too much and using ricotta salata that was very salty. I’ll use goat cheese next time and won’t salt the water so much. It was still great. I like salt. Here’s a great tip I just ran across: bake whole squash for 10 min at 350 degrees to make it easier to cut/peel. I just tried it with a butternut, and it was very helpful! Absolutely a must for me!!! I made the following adjustments to this recipe: I coated the squash with avocado oil for roasting and set the oven temperature at 425 so I could get good carmelization. I used white wine vinegar instead of sherry vinegar. I used shredded parmesan cheese rather than ricotta salata and I added 1/2 cup of pepitas rather than 1/3 cup. I used butternut squash oil to dress the salad at the end rather than olive oil. This dish was absolutely delicious! It will be a regular at my table. I had vegan, gf guests unexpectedly coming for lunch and dinner with two hours to spare, no possibility of running to the store and a bathroom to clean. I threw together this and your three bean chili with minor alterations in deference to my pantry deficiencies. (Let’s just say, two beans were plenty.) I managed to be ever-so-coolly sipping a cocktail by the time they arrived AND to knock their socks off at both meals. This is just to say, thanks for doing the heavy lifting on half of the meals I’ve prepared over the past four years. Much love to you and your joy-filled little kitchen from us in the motherland. Update: I wanted this to work out better and blamed my particular squash for the poor result initially so tried again! I have since made this several times and it comes out wonderfully as written with no adjustments! A must try! Since I can’t ever leave well enough alone, I tried a southwest riff on this without ever auditioning the original (sorry!). I swapped the farro with some black beans, the ricotta with sharp cheddar, and added some chopped up chipotle in adobo (as well as some of the adobo sauce). I did keep the squash, pickled onion, and pepitas. This has become a go-to lunch and summer bbq side. Someday I will have to try this as written, but thank you so much for the inspiration. I made this for lunches this week with a few tweaks – they may sound odd together but somehow it all worked and it was delicious. Roasting the squash with some combination of spices sounds like a great idea–I found the dish as written a little bland. Absolutely delicious, my go-to lunch for a busy week. I love it with crumbled goat cheese best! Thanks for this new staple, Deb! Faced with 5 medium butternut squash from my CSA, I devoted some to making this salad. I was initially skeptical of its outcome based on the small number of ingredients, but I have had it for dinner last night, lunch and dinner today, and I still find the balance of flavor amazing! The small amount of pickled red onion fits perfectly with the sweetness of the squash and the salt of the ricotta salata, and the smoky flavor of the freekeh I used (having no farro on hand) only added to the amazing meld of flavors. It was delicious cold for lunch and freshly made and still warm for dinner. Thanks for this amazing recipe! I’ve been wanting to make this for years but never seemed to have all of the ingredients, so yesterday I finally decided to make it work with what I had – and it was fantastic! I used a yellow onion pickled in apple cider vinegar (delicious but red onion would look prettier), feta cheese, and frozen butternut squash (a bit mushy but still tasty). I’m looking forward to trying the recipe one day as written, but in the meantime I’m happy to know that substitutions also create a wonderful dish. Thanks Deb! I thought nothing could be as good as your Kale Salad with Pecorino and Walnuts! This salad is absolutely delicious – a perfect winter salad (for all seasons). Any gluten free grain recommendations? Made this because our CSA is already poppin’ out beautiful butternut squash. Made this today with toasted pine nuts, arugula, feta, and roasted the squash with sumac and paprika. I doubled the onion and pickling juice intending to save some, then ended up adding the whole batch, which gave the whole dish a nice tang to cut the squash’s sweetness. Amazing as always Deb! This was a big hit with my slightly picky spouse. The squash was sweet, the pickled onion was a good strong contrast, and the slivered almonds worked well in place of the pepitas that we didn’t have on hand. Plenty of pepper on the roasting squash helped a lot. Just wanted to drop by and say thank you. When you first posted this recipe I was a busy grad student, overwhelmed and underfed, and this grain salad was a comforting, nutritious addition to my diet of granola bars and yogurt. :) Six years later and this is still one of my favorite recipes–it’s something I look forward to and enjoy every autumn. Although I love the story behind your recipes and I always read them, I want to be able to print out just the recipe for my files. How can I do that? A bowl full of fall right there. Love it! would this be good with arulgula? Yes! I usually toss it with arugula or baby spinach for extra greens. I love this recipe so darn much. I make it at least every couple of weeks once Fall hits and every time super delicious. While the base recipe is incredible, I make just a few adjustments for my personal taste: double the pickled onions/shallots (they just taste so good), drop the olive oil a bit, and add fresh thyme to the farro. I also cook the farro in chicken broth, not sure if it makes a difference, but it’s a habit my mom passed to me and I just usually cook grains in broth for extra flavor. Seriously, though, no changes are really needed to this recipe, it’s incredible as is. I discovered this recipe this fall and probably have made it – no lie – 15+ times since then. I bring it everywhere. I just ate it for dinner. I usually toss a whole bag or more of baby spinach/arugula with the farro or barley (I’ve made it with both and preferred barley) right as it’s finishing, so the greens wilt down for some added veggies. So good, Deb! I make this all the time, and make it even more “grains as an accent” by wilting chopped kale in the oven and mixing it in, and I love this salad SO MUCH. Thanks Deb! Just wanted to let you know this is a ‘greatest hit’ years later!! I made this the other night with pasta (I like farro but I was out of it) and feta, and I’m here to tell you I’m finishing off the last of it for lunch today and it’s still delicious. I am sitting at my desk at work already thinking about lunch because I brought this salad and cannot wait to eat it. It tastes so fresh and flavorful. I love the added crunch of the pepitas and the balance of the sweetness of the squash and the tang of the pickled onion. The farro makes it filling so I do not get hungry later in the afternoon. Thank you so much for this recipe! 1. I am new to adding grain to a salad! I’ve added rice with micro greens and enjoyed it immensely. Thank you for the idea of adding it as an accent! 2. Congratulations on creating and publishing a book! I’ll check it out! I’m so happy you did this because it is inspiring. 3. I do not like peeling raw butternut squash or any squash. My favorite way to prep is to roast/pressure cooker whole and then peel and cut. It saves so much time. Sometimes the squash is too big and I’ll cut it in half…but that’s a lot of work, so I usually get smaller ones when I want to put it in my instapot. 4. Your Photography is beautiful.